If you are looking for the finest Las Vegas has to provide then the AAA Five-Diamond award winning Bellagio is the ideal location for you. Whether you are preparing a Las Vegas wedding event, a weekend party vacation or a relaxing week next to the swimming pool, the Bellagio provides everything you may require and it is all first-rate. Only a short cab ride from McCarran International Airport but, always watch out for the unscrupulous taxi drivers who “recommend” the long way to avoid traffic, (insert “wink wink” here). Luckily, Las Vegas has cracked down on many of these unfriendly tourist practices but, it still pays to be aware and not act like its the first time you’ve been to “Vegas.” Another fare and safety check is to ensure your smartphone is programmed with directions from the airport to Bellagio. Bellagio offers many great dining restaurants. Perhaps, the only resort on the Strip with more fine dining choices is Wynn Las Vegas. These dining establishments have the names of the finest celeb chefs in the world attached to them. Todd English is recognized worldwide for his creative adaptions of contemporary Italian cuisine. At the signature Todd English’s Olives at Bellagio his restaurant showcases a much more extensive Mediterranean food selection. Partake in house-made pastas, steaks, rotisserie recipes and brick oven pizzas. Don’t forget to take advantage of sommelier-recommended wines and the possibility (first come fist serve) to eat outside with Lake Bellagio as your neighbor. Michael Mina, who has many dining establishments in Las Vegas, has the appropriately named Michael Mina at Bellagio. 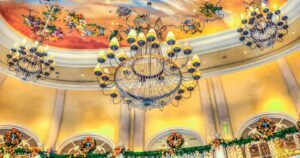 And if you are trying to find a more casual dining experience Bellagio also provides the Cafe Bellagio, The Buffet, Pool Cafe and FIX Restaurant for more traditional American fare. For an Asian influenced meal head over to Noodles, Jasmine or Yellowtail Japanese Restaurant & Lounge now featuring contemporary Chef Akira Back. Superstar Chef Jean-Georges Vongerichten has put his signature on what a steakhouse should be. Dining at its finest at PRIME Steakhouse. Voted “Best Steakhouse in Las Vegas” by Las Vegas Life Magazine, the menu offers prime meats, seafood and chops. Not too be missed is the Filet Mignon or Chilled Shellfish Platter. Besides the food and extensive wine list, enjoy the Tiffany inspired blue décor! One thing for certain, shopping at the Bellagio is not for those on a budget plan. If you have a “shopoholic” spouse, best to keep them away. Nevertheless some of the most popular designers in the world find themselves a retail presence at Bellagio; Armani, Chanel, Dior, Prada and Yves Saint Laurent. For the BIG spenders, Tiffany & Co. and Fred Leighton are the ideal stores for you although we can’t vouch for your bank account. Not everything at the Bellagio includes a high price tag. 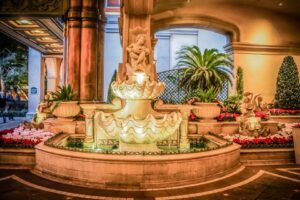 The Conservatory & Botanical Gardens is free as well as something not to be missed, especially when you need some time away from the sensory overload Las Vegas can provide. This unique setting features hundreds, if not thousands, of aromatic and gorgeous plants and flowers year around. Another freebie courtesy of Bellagio and one to not be missed, is the Fountains of Bellagio. Located in Lake Bellagio on the Las Vegas Strip the fountains are choreographed to music that by now have probably ranged from a Mozart Aria to ZZ Top. When unbelievable lighting is added for remarkable effect, the Bellagio Fountains are breathtaking morning, noon and night! If it’s an indulging (and why else would you stay at the best of the best?) you’re after, book a room in the Spa Tower. This portion of the Bellagio offers expansive rooms and suite upgrades with large steam showers complete with deep soaking bathtubs. As one might garner from the name, the Spa Towers offers a broad array of full-service day spa treatments as well as beauty salon. Bellagio has one of the greater staff-to-guest proportions in the Las Vegas community. This results in noticeably better stay even if aren’t actually aware of just how many people Bellagio has on staff. In a super guest friendly way, they make a huge building seem inviting and welcoming. Don’t be shy about aksing the staff, for “locals” travel tips either as some of these offer local establishments offer a much different (and usually cheaper) Vegas experience.